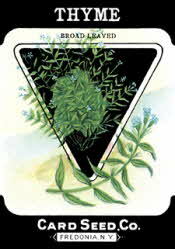 The herb Thyme is the dried leaves of Thymus vulgaris, a small perennial of the mint family. The leaves measure about one quarter of an inch in length and one tenth of an inch in width. The plant grows about eighteen inches tall and produces small flowers that are very attractive to honey bees. Thyme is one of the herbs and spices used by the ancient Egyptians to preserve mummies. Ancient Greeks thought that thyme gave one courage. During the middle ages in Europe, a sprig of thyme was placed under the pillow to induce sleep and to prevent nightmares.